Together, these visions form part of what is commonly called the Apocalypse. The Apocalypse comes to earth in the wake of four thundering horsemen, each riding a horse of a different colour, each one personifying and bearing a particular evil and horror. The first, a white horse, is the horse of conquest, the destroyer of freedom, the enslaver of humanity. The second horse, the vivid red of bloodshed, brings in its wake the devastation, barbarity and unspeakable losses of war. The third, bleak and stark in black, symbolizes famine and hunger, the fallout of lands that are barren and arid. And the fourth horse, a chilly pale grey, is the harbinger of Death, the ultimate end of everything. Whether these are visions of events from the past, the future, or are allegories intended to warn and teach, there is no questioning their spine-chilling power to terrify and shock. Cultures and religions around the world have versions of an Apocalypse; interestingly, several include a horse that ushers it to life and action, including Hinduism's Kalki, the final avatar of Vishnu, who it is believed will arrive on earth riding a white horse to destroy Kali Yugam, the Evil Epoch. We like to believe that we live in the most malevolent of times but the truth is that the history of mankind has been soaked in the blood of horrific wars, riddled with famine, hunger and plague, shackled by the forces of inequality, slavery and conquest, haunted by the spectre of death and ageing. And it is tempting to conceive of, to have faith in, a force that will sweep all these catastrophes, sins, pain, and suffering away and bring forth a fresh start, a clean slate, a beautiful new world full of hope and beauty. Ahhh - Hope - that one emotion that did not escape from Pandora's Box, the force that keeps humankind moving forward. And Beauty - thank goodness for its omnipresence, through all the ugliness and despair that permeates the world! I was blissfully enveloped in the elevating presence of both hope and beauty at a wonderful performance (March 7 - 10) by Jiva Dance, one of New York City's most exciting and innovative Bharatanatyam companies. Held at Dixon Place in Manhattan's lower east side, it was the NYC premiere of their production, The Four Horsemen, their interpretation of the Biblical allegory of the horsemen of the Apocalypse. It was an intensely personal exploration, from a woman's perspective, of the situations and emotions evoked by the horsemen. It delighted me to see that this was a truly collaborative venture, with people across multiple generations, continents, dance companies and diverse other talents pooling their resources to create this wonderful show. Such synergistic efforts were all too rare while I was growing up and it filled me with optimism to see egos and once-stifling protocol set aside for a larger good. 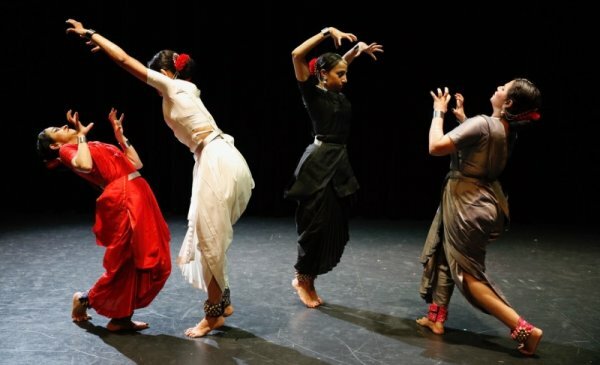 Also, Bharatanatyam has well and truly entered the 21st century as it engages with an increasingly wide range of themes and ideas, pushing into thought-provoking political and socio-cultural realms, the abstract and the concrete, and embracing the myths, stories and issues of the world at large. Such is the power, range and adaptability of its vocabulary, that it can do this without compromising on its basic, core foundational elements. This is critical, for the dance to remain relevant and grow, and how wonderful it is to see it thrive, in productions like The Four Horsemen. The show began with a succinct yet thorough introduction by the gracious Maya Kulkarni, who, along with Sonali Skandan of Jiva Dance, was responsible for the concept and choreography of this production. It set the stage for the audience to appreciate and enjoy the show, regardless of how little or how much they knew about the Apocalypse and its horsemen. The performance began with all four "horsemen" on stage, dancing strongly to a vibrant "Januthaka" beat. They were Aishwarya Madhav (white horseman); Sonali Skandan (red horseman); Amrita Doshi (black horseman) and Bharathi Penneswaran (grey horseman). The stage was bare, with a black background and I loved the spare, clean lines of the dancers' costumes (simple ones in the colours of the horses) with minimal jewelry. The "traditional" Bharatanatyam look would have detracted from the dark and dire mood of the piece. Three of the dancers pulled away and Aishwarya Madhav, the white horseman, was left on stage. To the immortal words of the Bhagavad Gita, she brought to life the plight of the enslaved courtesan who dreams of freedom from captivity. I appear, epoch after epoch. The melancholy music echoed the sad sentiments that she portrayed so poignantly. This was followed by a cheerier section in which she imagines she is as free as a bird; after all, the mind cannot be suppressed unless it is allowed to.....but then reality is harsh and takes over yet again. Aishwarya's abhinaya was beautifully evocative of her sad circumstances. This section over, there was another, largely percussive, choreographed sequence of the four horses to lushly orchestral, apocalyptic music. Then it was the turn of the rider of the red horse, Sonali Skandan. Her lover is going to war and she is distraught. With what melancholy she brought to life the heart-broken lover, to the words of one of the greatest lyric poems of Sanskrit, Amaru Shatakam! How vividly she depicted the horrors of war! With what tenderness she imagined her last night of pleasure with her warrior-love.....but alas, all good things have to end, the morning dawns, her man leaves for the battlefield, and she is drowning in unbearable anguish and sorrow. I found the music a bit too obtrusive and loud for the intimate, personal emotions that were conveyed; the mood desired could have been better created with subtler music. Back came the four horsemen, swaying ominously, laying the groundwork for the arrival of the black horse, danced with heart rending intensity by Amrita Doshi. As the lights intensified and then dimmed and the music turned ominous, Death's pleasure grounds were laid bare before us, a parched wasteland under a scorching sun, through which a mother and her child wandered, the child's playfulness turning to despair, the mother's attempts to cheer her child withering in the heat, as any hope of food and water vanished. Strongly percussive Kathak-style movements highlighted the moments of high anguish. This was yet another powerful performance that ended with the barest hint of promise, when a lone green shoot appeared in the wilderness. Then finally, the rider of the grey horse, bringing with it the chilling spectre of old age and death. 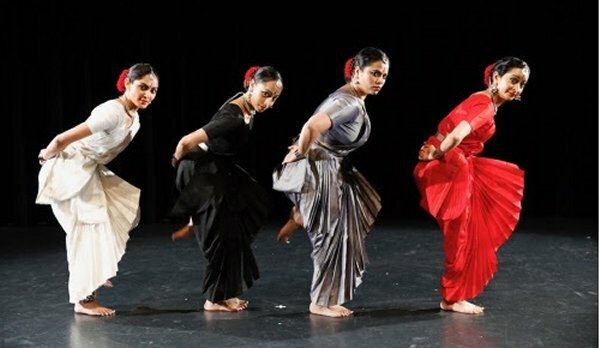 Bharathi Penneswaran's brilliant abhinaya and footwork were in full display as she remembered the good times of her bygone youth, all these memories now snatched away by the inevitability of ageing and the impending end of life. The music was from a thillana, apt for an ending. As the grey horse danced its final dance, the other three horses reappeared and joined forces for a rousing, percussively thrilling end. It ended the performance on a high note of hope and renewal. The juxtaposition of the four horsemen dancing together before each individual one made for particularly powerful choreography. Together, the four showcased their combined power and also created the mood and set the ground for the individual vignette to follow. The movements suggestive of power and subjugation before the scene with the white horse; of warfare before the red horse; of a blinding sandstorm before the black horse; and impending death before the grey horse served to heighten the mood and tension and were a wonderfully imaginative and inspired touch. This was a thoroughly enjoyable performance. The dancing, by all four dancers, was absolutely top-notch. The choreography was outstanding, and the whole production was tightly woven together and perfectly executed. The music by the acclaimed Chennai-based composer Rajkumar Bharathi was full of verve and vigour. My only quibble with it was that in this theatre, in this setting, it sometimes sounded jarring; a more understated, gentler sound would have been more fitting. But then again, it was meant to convey the thunder and drama of the Apocalypse, which it certainly did do. I think this performance deserves to be showcased in a much bigger theatre, where all the elements would come together much more powerfully.